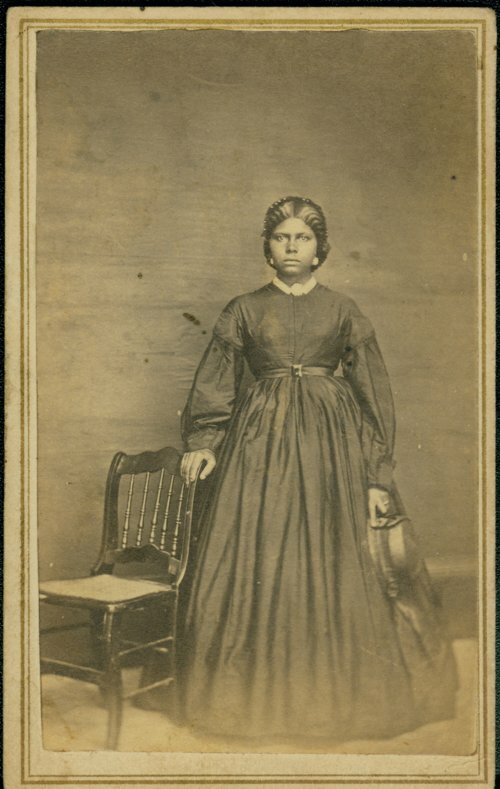 This is a carte-de-visite showing an unidentified African-American woman. The photograph was probably taken in Topeka, Kansas, and given to either Jeremiah Platt or Luther Platt. Jeremiah, an abolitionist, came to the Kansas Territory to promote the anti-slavery cause. He was part of the Beecher Bible and Rifle Colony in Wabaunsee County, Kansas, and taught at Kansas State Agricultural College. Luther came to Kansas in 1865 and taught at Lincoln College, Topeka, Kansas, and later became a Congregational minister and served several churches in southeast and western Kansas.